A few months ago I published a chart for ISIS which I’d picked up at the British Astrological Association Conference on the understanding that it had been drawn up by Professor Geoffrey Cornelius. A flurry of emails followed with some discussion whether it was the right chart. Things went a bit blurry after that. The simplest thing, I thought, was to ask the chart’s creator for the right data. So I did and he wrote back this charming email with his reasoning and the data, which is indeed different not only from my chart, but from the other charts published on the internet citing Cornelius. You’ll be relieved to hear that in essence it is most similar to the first chart I published (in fact it strengthens it), so all your comments still hold — but we like to get things right here at the OA. After your first email I went back to my sources and made a few extra notes. I’m minded to put these online after doing some pure astrol research on the material, but in order to not to delay a response to your question, here are a few points. The chart I showed at the AA Conference (‘Caliphate’) is for Sunday June 29 2014 7:39:50pm BAT (-3h) Ar_Raqqah, Syria 35N56 39E01. Asc 7 Cap 52 Moon 3 Leo 57 (astronomical sunset). I am not sure how you may have arrived at June 28th. The news broke onto world media on the 29th to the best of my knowledge – if you find an earlier source please do let me know. I note that astrodatabank has a different date (June 28) and cites Geoffrey also. I think I wrote down this date at the conference. Flip down to second video clip and you’ll see Isis fighters celebrating the announcement. Look at the light on buildings and cars; this looks close to sunset. The second strand of the evidence is that Isis wish to commence their Caliphate for the start of the holy month of Ramadan. This is a powerful message to all Muslims, since the observance of Ramadan is the fourth of the five pillars of Islam. This is the ninth month of the Islamic calendar, and in this month Muslims across the world fast during the hours of daylight. In the Islamic lunar calendar, the month (day 1) is marked by the appearance of the crescent moon at sunset. For 2014 start of Ramadan was precalculated as falling at sunset June 29th (many sources on web). Just after sunset is performed the evening prayer called ‘maghrib’ (literally ‘sunset prayer’). Published tables for the timing of prayers show that this was established for Ar-Raqqah for 7:51pm BAT (11m after the astronomical sunset I used). This could be taken as the symbolically intended time for the Caliphate, and it would be interesting to test it. The fighters will be praying at 7:51pm (the first prayers of Ramadan), not firing their Kalashnikovs. This is Isis’ most secure base in Syria – at the time the only one of Syria’s provincial capitals in their hands (captured March 2013). There is a further fortuitous reason (see Wiki etc, from which I am quoting): the city was briefly the capital of the Sunni Abbasid Caliphate between 796 and 809 under the reign of Caliph Harun al-Rashid. After the return of the court to Baghdad in 809, Ar Raqqah remained the capital of the western part of the empire including Egypt. Isis wish to emulate the earlier Sunni caliphate – Baghdad would be their ideal prize, but short of that Ar_Raqqah has a deep connection with their understanding of history. I hope this establishes credentials for my original sunset choice. It appears to yield a most powerful and radical horsocope. Please feel free to cite any of this material if you want. Geoffrey Cornelius is one of the most respected astrologers in Europe with decades of research and teaching experience. He’s the author of The Moment of Astrology — a powerful, philosophical exploration of astrology as divination. He also ran the MA in the Cultural Study of Cosmology and Divination at the University of Kent and is currently teaching on the MA in Myth, Cosmology and the Sacred at Canterbury Christchurch University. On the subject of ISIS, I asked another source about the acronym DAESH, which is the word used for ISIS in the Middle East. It stands for Dawla al Islamiyya fi Iraq wa Sham (the Islamic State in Iraq and the Levant). Astonish (Uranus) opposite stomp (Mars) perhaps. So there you have it. Personally, I would like to know where Lilith is in this chart, as their way of treating women as non-existent is very clear. At the exact timing of this declaration of the “Caliphate” I believe it was in Leo at 13 degr. That would be spot on the cusp of the 8th house. And is it possible to determine what the “lifespan” is of this “deadly disease” (because that is what this movement is to most of the people). Good point about lilith. I’ll look into this once I’ve finished April scopes. 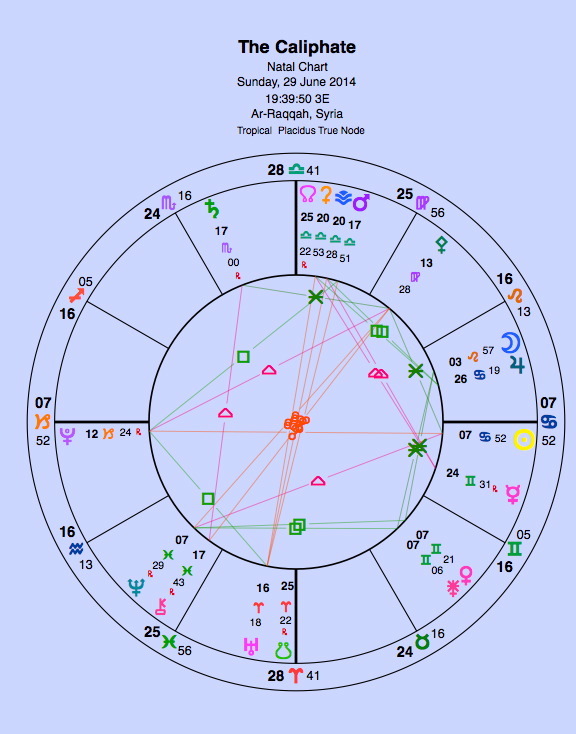 And what I notice is the saturn/chiron quincunx and uranus aspecting both the aforementioned planets. Mars is passed aspecting uranus. Again, wont end well. I have Lilith at 13°06 Leo just applying to the 8th house cusp. Your Lilith on this same position makes it very difficult to comment on this. I just looked again at this chart and saw Pluto at 12 degr. Capricorn on the Ascendant. The 8th house is dealing with endings and new beginnings, so could it mean for IS first the birth of this movement coming from a very deep loathing of the freedom for female forces in the Western world?? And in the end the opposition of this same deep loathing of the global female force that will make every female turn against it (and then I mean every female in the world) and then that is going to bring it down in the future ??? For you Christina, this could of course mean very different things – the 8th is also about other people’s money. Start writing about it ! Oh sorry — not my personal Lilith — I just meant the Lilith for this chart! My own Lilith is far away at 26° Aquarius. But I agree with you: a big motivator for this movement is a hatred and fear of female power, so it’s interesting to look at the pairing of the female planets — Vesta & Ceres, Venus & Juno, the Moon applying to Lilith. It is clear in the source notes for the chart at AstroDatabank that your previous publication of a chart for IS was the source of the information. Thanks for that Kevin. Followed your suggestion and found that Cran had done it for me… Didn’t realise the error had gone uncorrected. It does seem to be accurate, at least in relation to the way I feel about ISIS. Jupiter in Cancer seems to have really brought out my Mars in Capricorn like never before. Their Sun in Cancer has a looser opposition to the rest of my Capricorn stellium, including Saturn, Uranus, and Neptune. The only way to describe it is that… it’s like this grim determination that I won’t let them get away with this or have their caliphate, and I don’t care what it costs me, because I’m convinced it is the greatest evil in the world and cannot be allowed to exist. I have this strange feeling that I’m motivated to defend civilization in general, rather than the United States or even my own family. It’s as if I would press on alone, helping and defending whoever was left to resist ISIS even if my family were gone and my nation destroyed. I don’t fully understand why I feel so strongly about it. Even 9/11 didn’t get under my skin the way ISIS has.